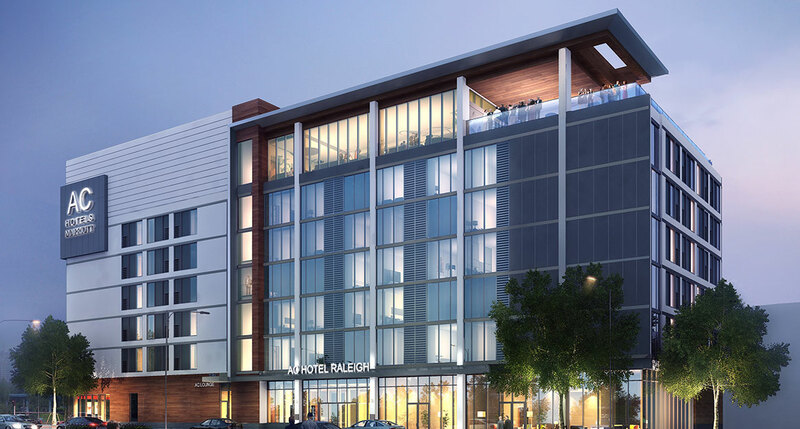 Concord Hospitality Enterprises and Kane Realty Corporation announced Thursday afternoon that they will develop and operate North Carolina’s first AC Hotel, a Marriott International lifestyle brand, in Raleigh’s Midtown at North Hills. This will be the third hotel for North Hills, an innovative mixed-use district that includes high-end boutiques, well-known department stores, the Triangle’s best dining and a year-round calendar of entertainment. The new AC Hotel, a 133-room upscale property, will be located in the Park District at North Hills and is slated to open in 2016. Founded in 1998, AC Hotels is an international hotel brand with nearly 100 hotels located primarily in Europe. AC Hotels target travelers searching for a design-led hotel in a great location. Sleek, sophisticated, European-inspired aesthetics bring the culture of the location alive to support the guest experience., according to its website. AC Hotels and Marriott International formed a joint venture in 2011 to expand the brand into the United States and further abroad. AC Hotel Raleigh is one of more than 30 hotels set to open within the next three years throughout the U.S. and Latin America. Other U.S, properties include: New Orleans, Kansas City, and Miami. In 2001, Kane Realty purchased North Hills Mall, an aging and failing enclosed mall established in 1967, with the intention for redevelopment. It closed the mall in 2003, and reopened North Hills in late 2004. Located in the heart of Raleigh, North Hills is off Exit 8 on the I-440 interstate, and is only 15 minutes from RDU International Airport. The multi-faceted district is home to numerous luxury apartment complexes, more than 700,000 square feet of office space and many outdoor gathering spots. Quality-of-life options include spas, salons, and a state-of-the-art 60,000 square foot gym. Entertainment outlets include a 14-screen cinema and bowling center, as well as a range of dining establishments from quick-serve to fine dining, high-end boutiques, department stores and cafés.